We know you want the numbers and we're not going to waste your time. Neither is Nissan. Its 2009 GT-R hits 60 mph in 3.3 seconds, quicker than the last Dodge Viper, Corvette Z06 and Porsche 911 Turbo we tested. Keep your foot pinned, and after another tap on the upshift paddle it will clear the quarter-mile in 11.6 seconds at more than 120 mph. Activating the GT-R's launch control is a matter of configuring its transmission, dynamics control and damping adjustments properly. The transmission and damping switches must both be set to the R mode and the VDC must be switched off completely by holding the VDC-R button down for a few seconds. Then it's just a matter of pinning the brake with your left foot and wooding the throttle with your right, not unlike the technique used to produce a tire-shredding burnout in that '85 Camaro you drove in high school. The result, however, is quite different. The computer holds the engine at 4,500 rpm and waits for you to lift your left foot off the brake pedal. When you do the GT-R produces the most crushing acceleration of virtually any production car in the world. 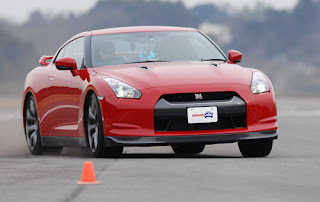 Our test was conducted on a fairly low-grip surface that produced lots of rear wheelspin before the GT-R's sophisticated all-wheel-drive system engaged the front wheels and it thundered down the track. Its 3.3-second 0-60-mph run and 11.6 at 120.9 mph performance make the GT-R the quickest car we've ever tested. It's even quicker than the Porsche 911 Turbo Tiptronic, but not by much. The German hits 60 mph in 3.4 seconds and blasts through the quarter-mile in 11.6 at 118.5 mph. Due to their lack of all-wheel drive, the Dodge Viper and Corvette Z06 are held back by traction limitations. Despite its 600-hp V10, the last Viper coupe we tested reached 60 mph in 3.7 seconds and finished the quarter-mile 11.8 at 125.3 mph. The Corvette Z06 isn't even close. Once impressive, its 4.1-second 0-60-mph run and 12-second quarter-mile at 121.8 mph are now well off the pace, which is why Chevy is creating the supercharged Corvette ZR1.